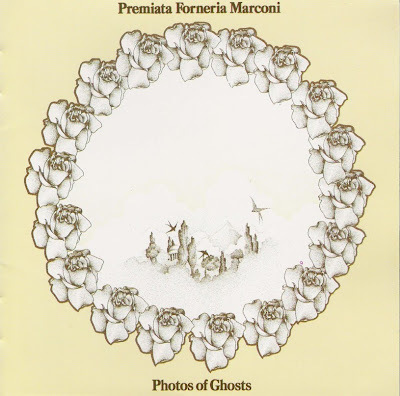 PFM released their second album, Per un Amico (For a Friend), in late 1972 and saw it again rise to the top of the Italian charts. No wonder, the band toured up and down the boot in support of the fantastic album. As a result, they signed to ELP’s newly formed Manticore label to seek success outside their native Italy. Pete Sinfield signed on as lyricist and producer for Photos Of Ghosts, their first English language album. Basically a remixing of their second album, the album did feature two new recordings. The high steppin’ "Celebration" was reprised from their first album, while the quiet instrumental "Old Rain" was altogether new. Both "River Of Life" and the title track though reek of the attention to detail that PFM bought to their compositions. Where other bands tended to use instrumentation or musical invention as a bag of tricks, PFM used all of their talent to create something genuine. The only track sung in Italian, "Il Banchetto" features some delicious synthesizer lines from Flavio Premoli, while "Mr. 9 ‘till 5" is positively electric. Whether or not the English lyrics added or subtracted to the original music is open for debate. (We like it.) Not surprisingly, the album focuses on the gentler, reflective moods than its Italian counterpart. PFM’s skill in arrangement took another step forward, although some foreign influences did persist (notably Gentle Giant). PFM held their debut concert in the UK in March, followed by their first tour outside of Italy in support of Peter Sinfield (and Mel Collins). The album even entered the lower reaches of the US album charts.